5 Oak Avenue, Leire, Leics, LE17 5HN. Don’t forget to send your address! The rhythm and blues harp vocabulary available to the Honeyboy has been acquired in the only way possible, years on years of playing the harp with R n' B acts in smoky venues and recording studios. 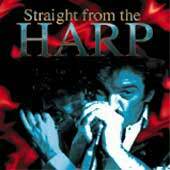 Brendan O'Neil - GERRY McAvoy - Anthony Thistlethwaite with appearances by GERAINT WATKINS - STEVE GIBBONS - THE KICK HORNS (RODDY LORIMER, TIM SAUNDERS, SIMON CLARKE) & BIG AL TAYLOR. Recorded in a 'studio live' situation, the recording features real performances by human players, unfettered by technological intrusion. No computer processors feature in the performances. Straight from the heart playing really. WONDERFUL NIGHT - I'm looking forward to playing this live, it's a good rocking fun song about a night in Winterthur. You can't stand still when Geraint plays the accordion like this. Goodbye Maureen - A very catchy 'Big Al' Taylor riff that Gerry, Brendan and I worked hard on to make into a catchy song. This was great fun to record and solo on. Listen out for Ed's rhythm guitar through the leslie speaker. DO IT ALONE - One of Brendan's. Geraint, still very sore and Bruised from a car accident, could hardly walk but he played and peddled some great sounds out of the old harmonium, had us all in stitches to boot. Delores - WHAT A NAME, WHAT A GIRL! A song I'd had Half Finished for ages, with a little help from Gerry it was complete in no time at all. If I'd known Ed was going to solo so beautifully he could have had two! EDDIE HAD TO LEAVE CHICAGO - A true story, but I've changed the names. I wrote this one on my CX-12 on the stairs I like the brushes, oh!, yes he had to leave London too! IT'S OVER - One of Geraint's songs, a rock 'n' roll Ballad. Everyone plays great on this, I'm glad I chose to record it. I enjoyed playing the acoustic harp solo. BLUE IT (INST) - Written in Bethesba after the pub and before the 'beach blanket bingo'. More great 'first take' guitar solos from Ed. JUDGEMENT DAY - Acoustic harp, Brendan plays the cardboard box, Gerry on Guitar, Geraint on accordion and Ed on slide. A great 'Sony Boy one' VIBE! MUMBLES (INST) - Moody Piano, and me playing my Walter Horton licks. This was the only track I managed to use my own amp on. LONG GONE - A riff from Gerry, great playing from Brendy. It was difficult to do the overdubs with Gerry go-go dancing next to me. Well It's my new album, very much a team effort. I'm very pleased with the playing and the 'lovely vibes' as the midget used to say. I really enjoyed the company of the chaps on this album, to write together, arrange the tunes, record, see the project through was fantastic. I think there's plenty of great players out there, but to find the ones with a positive attitude and seemingly never ending supply of great ideas is bloody great. 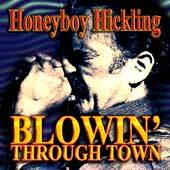 Blowin' Through Town is a live album culled from several gigs that took place in the UK between May 2001 and December 2002, with Simon 'Honeyboy' Hickling fronting two different versions of his electric band 'The DT's. In the company of his long time side-kick, guitarist Big Al Taylor, you will find Hickling either with Tony Stuart/Craig Rhind on bass and Tony Baylis/Alan 'Sticky' Wicket on drums. Hickling and his colleagues are so well integrated as a band you cannot hear the join. Hickling has a wonderful tone on harp and also possesses a good set of vocal pipes, which he and the DT's put to good use on familiar material like "Juke" and "High Heeled Sneakers' and less-familiar stuff like Hickling's own "Judgment Day". Big Al Taylor shows himself to be a top-notch guitarist who can give his old opo a good run for his money with his heavily West Coast-style-influenced guitar solos. This is how the current line-up sounds hope you like it! 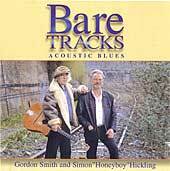 Another british blues guitar great is Gordon Smith. On Bare Tracks he teams up with Hickling to produce what is one of the best blues albums of the year from purely British players. The two players seem to be a blues marriage made in heaven, so well do their respective talents complement one another. Smith's splendid guitar technique is ably demonstrated on his own homage to Lonnie Johnson, the instrumental "Lonnie's Swing" and he also provides a superior version of Robert Johnson's "Good Friend", on which he also takes the lead vocal. 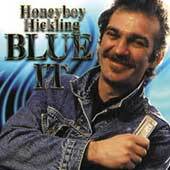 Hickling ably supports on harp throughout and also lends his own particular brand of vocal exuberance to tracks like Jimmy Rogers ' "If It Ain't Me" and Sonny Boy II's "All My Love's In Vain". All in all, the 13 disparate acoustic blues renditions on Bare Tracks , from two artists operating at the peak of their talents, are an unalloyed joy from start to finish.